Not quite finished. If I'm being really honest, not nearly finished. This is what I managed of my Tour de France project as the winner (a very impressive Mark Cavendish) rode across the finish line in Paris last night. I'm about two-thirds of the way through the tangles of the tangled yoke cardigan. I achieved about as much as I realistically expected to manage; but not nearly as much as I had hoped for. However, it's certainly much more progress on what's quite a major project for me than I would otherwise have achieved over the last three weeks. That's good. I'll continue with the cardi and try to finish it in the next couple of weeks so that my daughter can get a few wears from it before winter disappears altogether. But I won't work on it quite so obsessively. I need a bit of a break so that my knitting remains a pleasure rather than a duty, and my poor aging fingers and wrist recover. 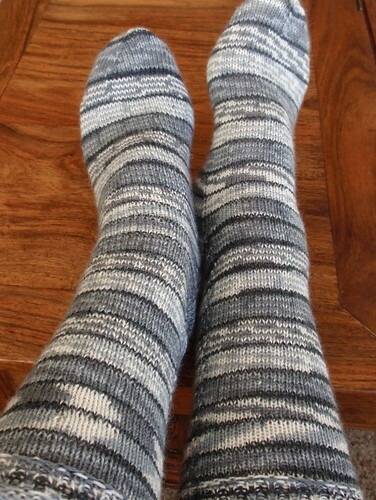 In my obsession with my TdeF project, I haven't posted about some socks I completed for a sock swap on Ravelry. My swap partner sent the yarn - Heirloom Jigsaw - and I've knitted a simple Nancy Bush pattern 'Dalarna' from 'Knitting on the Road'. The only modification was that I omitted the 'clock' pattern on the feet as my partner likes a smooth knitted finish for the feet of her socks. Lately I've been feeling a bit depressed about my knitting. I feel as if I'm not making as much progress as I'd like, and I feel oppressed by the self-imposed deadlines I'm missing. 'Child's French Sock' by Nancy Bush. 'Travelers' Stockings' by Nancy Bush. 'Country Socks' by Nancy Bush. 'Indigo Noragi' by Vicki Square - a jacket started more than a year ago and still only about 80% complete. 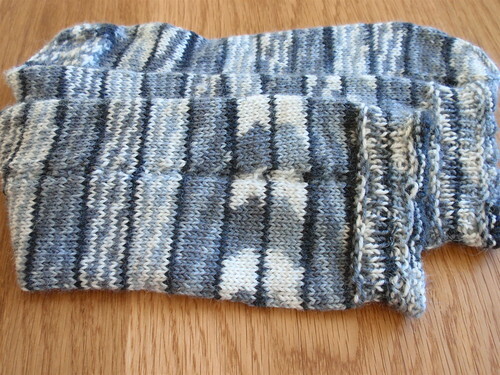 I love the pattern, the yarn is The Knittery's beautiful silk wool mix - in grey no less - but I can't manage to finish it! 'Tangled Yoke Cardigan' by Eunny Jang - my Tour de France project due to be finished tomorrow and I'm just at the beginning of the yoke. So, no chance of meeting the deadline. 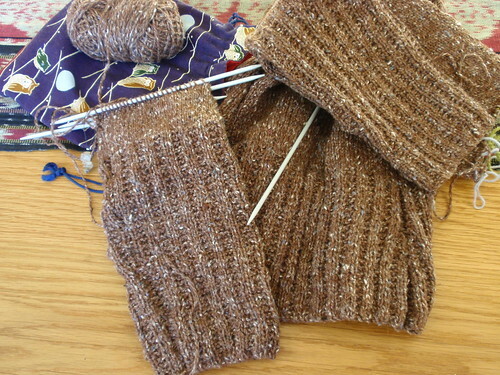 My Personal Sock Club project 4 - due to be finished Monday and I haven't even cast on. 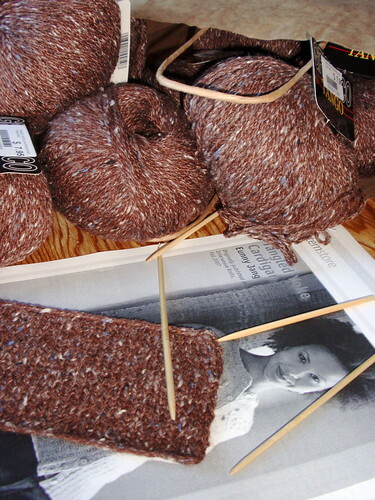 Four and two-thirds garter stitch trim hats (by Mustaa Villaa) for the Winterwarm Project). I think there's a message here. I'm much more efficient at completing things I've not programed than those I have. And, perhaps more importantly, giving in to the passion of the moment gives me a great deal more pleasure than moving systematically to the next project. I've discovered it's hard to postpone the pleasure of knitting with lovely yarns recently acquired, and unnecessarily disciplined to resist the pleasure of jumping on the latest knitting band-wagon or trying out a recently discovered pattern. But I don't want to give up too easily. I've reached a compromise. 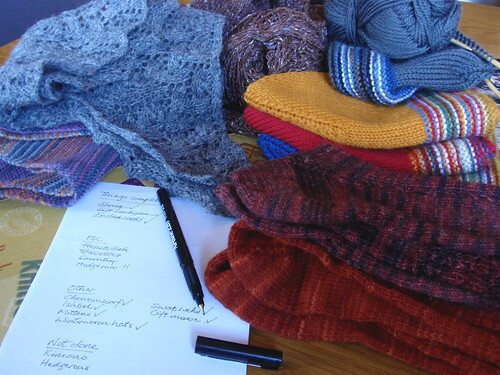 I'll finish my Personal Sock Club for the year, even though the current project will be seriously late, and I'll finish the Tangled Yoke cardi. Otherwise? I'll knit as the whim or passion takes me. Knitting is meant to be about pleasure, after all. After last night's stage of the Tour de France a very dejected Cadel Evans admitted he was 'out of the race'. Not literally of course (or a least I hope not); what he meant was that he had given up all hope of achieving what he had set for himself - a high finish in the general classification. At a more mundane and less career-damaging level, I feel much the same about my Tour de France knitting project - Eunny Jang's Tangled Yoke Cardigan. It is almost with relief that I've admitted to myself that I have no hope of achieving my goal and finishing it before the end of the Tour on Saturday. Like Cadel, this doesn't mean I'm giving up the race (or a least I hope he isn't) but it does mean I'm reconciled to not achieving as well as I had hoped. I have really truly tried; but it just seems to take so much time and energy to get a little done when others are streaking ahead. But I have adjusted my goals - I'm now determined at least to get to the eponymous tangled yoke - and will continue on. 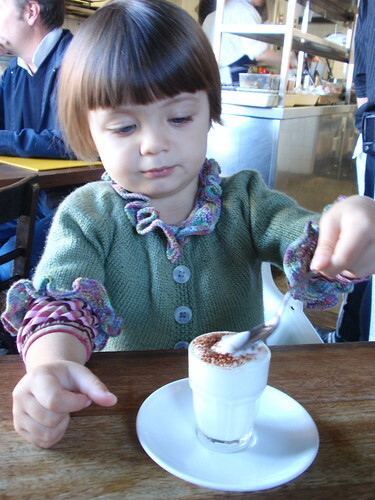 ...and such a quintessential Sydney distraction - Sunday breakfast out, complete with babycchino. 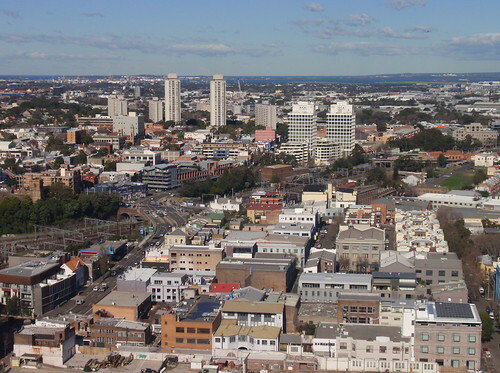 It's a view of the southern suburbs of Sydney, across the main southern and western railway line and the airport to Botany Bay. I can clearly see the building in which I live, and this gives me a strange pleasure - I think because it makes me feel that my life is deeply rooted in this part of Sydney. 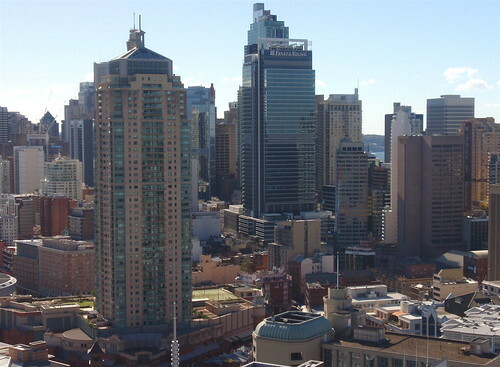 Chinatown is in the foreground; then the tall buildings of central Sydney and a glimpse of the Harbour in the distance. I've written before of how much I like living in Sydney. Having these views of my sparkling city so constantly and immediately available is a great gift. On Monday, the weekday I don't work, the dotee, her mother and I went to Kurnell to visit Botany Bay National Park. I foolishly forgot to take my camera. It's such a strange area, though a great deal of work has been done recently to make it more attractive and pleasant for visitors and to interpret its rather ambiguous role in Sydney's development and the history of modern Australia. As all Australian children learn in primary school, it's the site where Captain (then Lieutenant) James Cook and the crew of his ship 'Endeavour' first stepped onto Australian soil (or rock) in 1770. For Australians of my generation, we learned that this signaled 'the birth of the Australian nation'. I guess there is a sense in which this is true. It was on the basis of the reports from this trip - particularly the accounts of naturalist Joseph Banks - that British settlement in the Sydney area was later undertaken. And, while there was sophisticated Indigenous habitation of Australia prior to European settlement, the various Aboriginal groups would not narrowly be defined as a 'nation'. The park today portrays the area as a meeting point, and emphasises both the role the Kurnell Peninsula had and has for Aboriginal people, as well as its part in the formation of modern Australia. We were particularly delighted and surprised by a soundscape installed around some of the paths, where the voices of modern day children learning Aboriginal languages, playing, and calling to one another - even 'coo-ee'- are activated as you pass along the path. The dotee was intrigued, puzzled and entertained. But the modern setting of this meeting point is bizarre. How I wish I'd had my camera. Close to the memorial commemorating Cook's landing is a long quay for the pipeline from the nearby oil refinery that enables ships to be loaded with oil. Clearly visible across Botany Bay are the docks and cranes of Port Botany, now Sydney's main sea port. And the jet planes boom constantly across the Bay to land at the airport. It's a highly industrialised modern landscape, situated on a beautiful bay. Close to the park is Cape Solander, where you can view the ancient grandeur of the ocean cliffs south of Botany Bay and where on Monday various groups of people were watching for whales making their timeless passage along the Australian east coast. Much as I love cities, and Sydney in particular, Kurnell is unsettling. A disturbing mixture of the present and the past. The dotee and her mother (my daughter) are spending two weeks with me before returning to Brisbane. They've made the long trip back to Australia from Cuba; a twelve hour bus trip from Santiago de Cuba to Havana, a plane trip to Mexico City via Panama City (a detour necessitated by complications of Cuba's care in relation to swine flu), then from Mexico City on to San Francisco, and finally the long flight west to Sydney across the Pacific. A big trip for a two year old. They have an excuse for being a bit distracted (and a bit out of focus). And they are a pleasurable distraction for me. 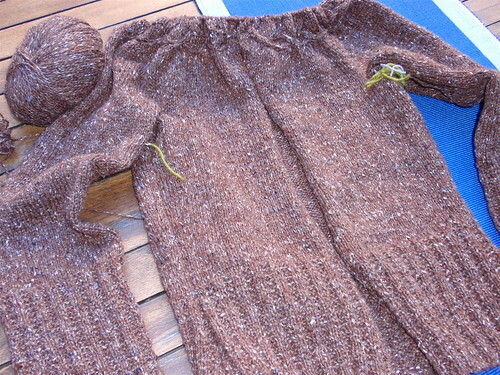 I'm not sure how well my Tour de France KAL project - the Tangled Yoke Cardi - will progress over the next couple of weeks. However, pleasurable distractions are to be valued. An update on my blog anniversary gifts. The names I drew randomly are Knitness and PomPom. Ness and Sally, I'll get your gifts to you over the next week or so. I do hope you enjoy them. It's one year today since my first blog post. I've come to blogging rather late, but have enjoyed it greatly - much more than I had anticipated. I like the impetus it provides to reflect on events in my life; I've enjoyed improving my still limited photographic and computer skills; unexpectedly, it's given me pleasure to take care with my writing; and I'm especially delighted when readers take time to comment on what I think and feel and make. And, I've just discovered I share my blog anniversary with Rose Red - such a pleasing coincidence! I've made some project bags this last week. Two of them are destined to be gifts for readers who leave comments on this post by midnight Tuesday 7 July, Sydney time. [I'll still be up at midnight watching the Tour de France!] I'll randomly select two people from amongst the commenters, and will make sure that the gift bags contain some yarn that suits the recipients. 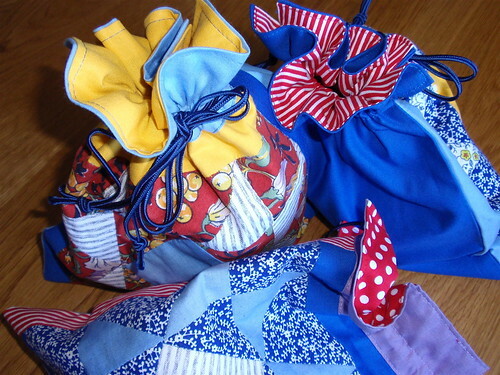 I've incorporated into the bags some hand-pieced patchwork squares I made sometime in the early 1980s - probably 1982. You could think of them as retro - certainly the colours are! 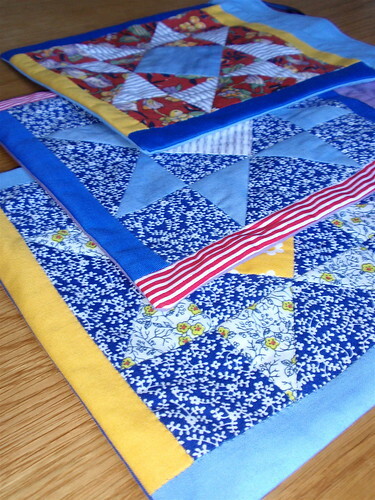 The patchwork squares are a traditional eight-pointed star pattern, and some of the fabrics are scraps from clothes I made for my daughter when she was small. 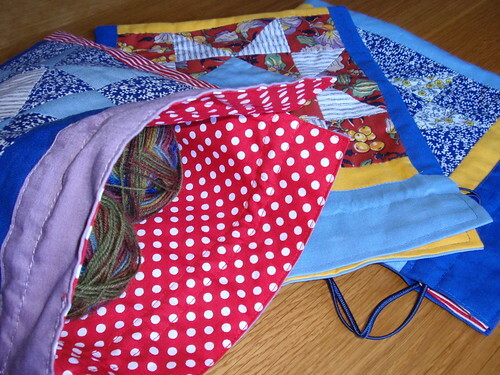 I suspect I must have had some grand ambition of making a quilt - but I think the project bags are a much more realistic use for the squares. You may have noticed that there are three bags in the photographs, and I'm only offering two gifts. The third bag has already gone to MissFee, whose birthday also is today. July 4 is clearly an auspicious date. It was good advice. I'm not sure that I've been able to follow it, and I know the blog isn't exactly as I want it to be. But trying to blog as if nobody's reading does help to eliminate the deep self-consciousness that has made me avoid writing in the past. So, thanks for the advice, Ali, and I'll try for a second year. I'm all prepared for le Grand Depart of the Tour de France on Saturday. More accurately, I'm all prepared for the Tour de France Knit-a-long, that I will begin at some ungodly hour on Saturday night / Sunday morning when le Tour starts in Monaco. Pattern...check! 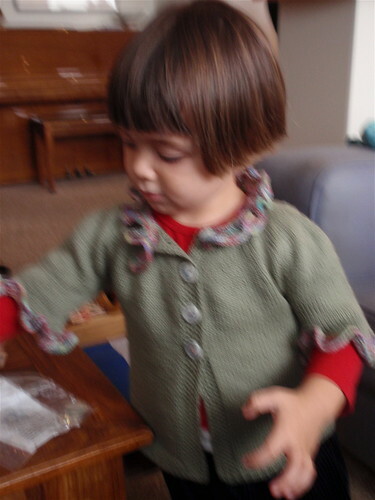 [It's the Tangled Yoke cardigan by Eunny Jang that I'm knitting for my daughter, who's fortunately smaller than I am]. Tension square...check! 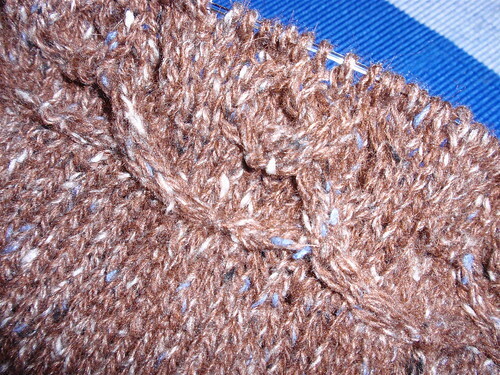 Correct tension achieved using 3.75 needles. Determination...check! Enthusiasm...check! Time...Hmmm. Capacity to stay up late night after night and knit...Hmmm. I've been a keen follower of the Tour de France for some time, and have been delighted over the last few years as the wonderful SBS in Australia has gradually increased its coverage of the race. Being able to combine watching the Tour de France - even at the unsociable times one needs to watch in Australia - with knitting, is my idea of bliss. Last year I managed to knit a cardigan within the compass of the race; but it was in 10ply (worsted weight) and this year's challenge is 5ply (sport weight). I think I've been a bit too ambitious. So, only a day and a bit to go to cast-on, and to try to finish my current sock project before I'm caught up in the Tangled Yoke.